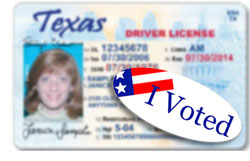 The RPT would like to inform you of an important update on the Photo ID legislation, SB 14, as the full Texas House is scheduled to hold debate on the bill this Monday, March 21st beginning at 11:00am. If you wish to be counted in support of this important bill, then we encourage you to attend the debate and sit in the House Gallery wearing RED shirts during deliberation on Monday. Debate may also extend into Tuesday as well, if the Democrats continue to stall the process as they did on the recent debate on the Sonogram Bill. This week, the Select Committee on Voter Identification and Voter Fraud, chaired by Rep. Dennis Bonnen, passed the bill on to the full body. On the House side of the aisle, at the time of this communication the bill is co-sponsored by 83 Republican legislators, and more are expected by Monday. The House Sponsor is Rep. Patricia Harless, joint sponsors are Rep. Larry Taylor, Rep. Aaron Peña, Rep. Vicki Truitt and Rep. Todd Smith. We wish to continue our thanks and appreciation for our Republican State Senators' leadership on already approving the measure which was authored by Sen. Troy Fraser. If you are unable to attend the floor debate, you can still watch the proceedings by visiting this link.